He looks just like a Clive! His nose dots are precious and highly squee worthy! 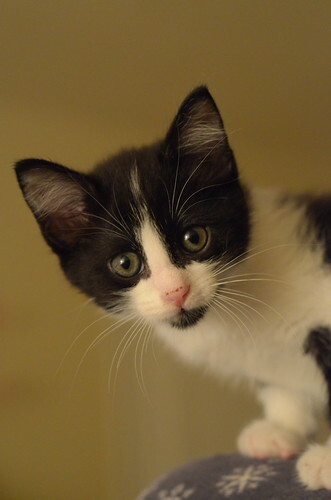 Hi Clive, you bright-eyed, whiskery little cutie!! Freckles! Tux! What's not to love! Hi Clive! You've hit the jackpot thanks to Laurie! Pleasure to make your acquaintance, Clive! Learn well from Miss Bean, and the rest of your life will be smooth sailing thanks to the great start you got at IBKC. Clive with the kitty goatee. Hipster kitteh!!! As always a purrfect name! How on earth do you so consistently match up names SO perfectly with the kittens? Even without knowing his personality, this little guy just LOOKS like a Clive! What a sweet little face he has....I'm melting. Again! I think his nose dots are breakfast. I agree Jenna. But Clive's breakfast dots are just the cutest lol. Hi baby boy - Mama Laurie does it again with another perfect name. Hello there, little man! You are just adorable, and so much cuter than that other Clive (Owen). And that's saying something! Are you ok with me being completely in love with you AND all of your brothers? He looks like a Clive! What a perfect name for a sweet little fellow. Clive looks like he has a little goatee! Check out little Bali in a jungle plant, totally cute. O.M.Freaking.G!!! Clive = Stealer of hearts, curious cutie, precious precious boy.